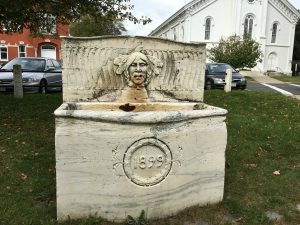 The Kilbon Memorial Fountain, an artistic and historical treasure in Lee’s Town Park, needs immediate restoration or it will likely be lost to the ravages of time. Designed by famed sculptor Daniel Chester French and carved of Lee marble by local artisan Dante Baccolini, the fountain has been a quintessential part of Lee’s heritage since its installation in 1899. Please consider becoming a partner with Berkshire Gateway Preservation in undertaking this important restoration.